20 Sep 2018, 9:48 a.m.
Urban areas are the dominant form of human habitat in the world since 2008 (UN Statistics). Yet, in India, the official urbanization rate appears to be lagging well behind other countries. Even by restricting our comparison to emerging Asia, urbanization rate was standing at 31.2% in 2011 as compared to 48.8% in the Philippines, 50.6% in China, 50.7% in Indonesia and 36.2% in Pakistan. Knowing both that India is often depicted as one of the most dynamic and populous country in the world and that national definitions and criteria of “what should be considered as urban” can lead to underestimation or hyper-projection of urbanization phenomena, our team decided to investigate urban structures in India. Data source: World Urbanization Prospects, the 2011 Revision, United Nations. In our paper, we first used a dataset linking the demographic census (with no regards to urban-rural official classification) with the spatial extent of the agglomerated spaces. 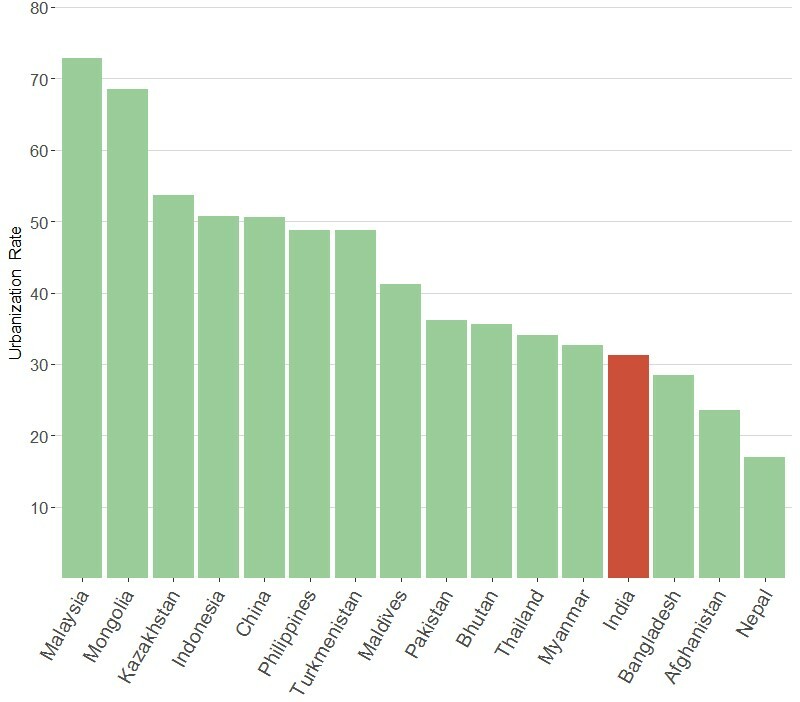 Second, a scoring technique, or in other words, the attribution of points to Indian’s cities according to several indicators (socio-economic, functional and demographic) allowed identifying the biggest and most prominent metropolitan areas. Third, urban “envelopes” (rural spaces complementing the agglomerated spaces), have been calculated within a Geographic Information System in order to encompass urban areas. Urban macro-structures, as in the article title, are the biggest aforementioned urban “envelopes”, encroaching upon several official Indian districts and acting as larger organizing frameworks in the regional spaces. Seven macro-structures that have developed specific urban morphologies over time (number of settlements, density, agglomerated space footprint, socio-demographic behaviors, etc.) have been identified around the most prominent metropolitan areas. These are, ordered in decreasing population: Kolkata, “Kerala – Tamil Nadu corridors”, Delhi, Mumbai, Hyderabad, Bangalore and Chennai. The paper proposes a detailed comparison of the three largest ones, hosting together a population comparable to the one of the United States of America. Our results show three completely different ways of structuring urban space within these huge urban macro-structures. They finally show that urbanization in India can take many different forms and is distributed in a heterogeneous way. This research was a wonderful opportunity to build a collaboration between three different entities: the academic French research unit ESPACE/CNRS (to which the three authors were previously affiliated), the French Institute of Pondicherry (host of the first author during 2 years) and the private company Renault (which partly funded this research). It was also the start of a lasting relationship between researchers interested in understanding urbanization structures and dynamics and now located in three different countries (Japan, France and Brazil). Despites our locations, our team is still collaborating and several publications are going to follow about various topics always related to urbanization. This includes for example a clustering of Indian districts, housing overcrowding in India, and the analysis of metropolitan morphologies in global coastal cities (Osaka, Marseille, Rio de Janeiro).